We are constantly inspired by the talent and initiative of young people. We recently had the pleasure of meeting Ann, Nellie and Lydia—three Grade 9 students from Churchill Secondary in Vancouver who wanted to make a difference. Together, they formed a non-profit-organization named LiveWritePaint. These students strongly believe in creativity, and want everyone to have the opportunity to show it. This weekend, they will be presenting an art show called Kaleidoscopes on Canvas, featuring artists from all around Greater Vancouver including Annie Tsai, Mark Galvina, Marv Skelton, Mary-Ann Bumerz and more. Artworks include watercolour, oil and acrylic paintings. The young artists from LiveWritePaint recognize the value of the arts in their own lives, and have generously decided to donate 50% of proceeds from this event to ArtStarts to help bring the arts to other young people across the province. Kaleidoscopes on Canvas takes place on Saturday, November 21, 2015, from 11am to 4pm, at the Steveston Community Center (Great West Room), located at 4111 Moncton Street in Richmond, BC. Come out and support young artists! 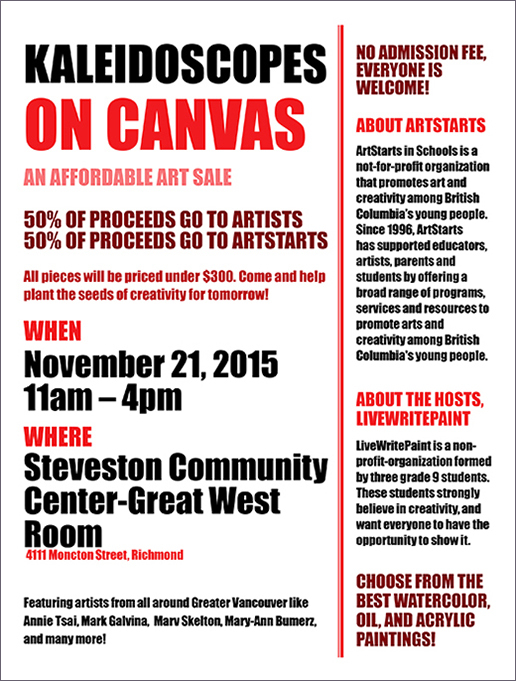 On behalf of everyone here at ArtStarts, thanks to LiveWritePaint for supporting creative experiences for young people across BC!